Are you a CEO who struggles to know what your #1 role is in today’s fast-paced, hyper-competitive world? There are many resources out there that will tell you that your role as a leader is functional, tactical or strategic. Or it’s to be a coach, teacher, servant leader, or visionary. However, none of these roles gets at the absolute root thing that you must do as a CEO in order to build a high-performing, high-growth, and high-energy workplace culture. And until you know the #1 thing you must do, everything else will fail. Hello everyone, this is Traci and today we are talking about what is the #1 role of a CEO? I know many leaders out there who are really struggling to know what their #1 role is as a CEO when you have so many competing demands and responsibilities. In fact, over the weekend, a good friend of mine flew into town and we were talking about this very issue. He’s about to take over a $100MM manufacturing company and he’s struggling to know what his main role should be. There are so many demands on his plate and so many issues to deal with each day, he’s doesn't even know where to start. As a busy CEO myself, I understand. Maybe you feel the same way, unclear about what your key role should be -- day in and day out. In the past, the role of the CEO was to be the jerk, who cracked the whip of fear, so that people got stuff done and shareholders were happy. Over the years, our thinking has evolved, however, to the role of the CEO being more about being a visionary, a coach, a teacher, or a servant – leader. And while all these roles are very important, in my experience of over 20 years of working with TOP leaders and brands all over the world - there is really just one, singular role of a CEO that I believe, tops them all. But here’s the problem -- The lack of clarity about your #1 role as a CEO, manager or leader of a team or department, means that you don’t always know how to prioritize all your responsibilities and demands. And then, on top of it all of that, because you don’t know what your chief role is, you can't even gauge if you’re succeeding or not! Now, there are mountains of books out there that will tell you that your role as a CEO is functional, tactical or strategic. Or it’s to be a coach, teacher, servant leader, or visionary. And I’m not disagreeing with any of those responsibilities. However, NONE of those daily responsibilities gets at the absolute ROOT thing that you MUST do as a CEO to truly build a high-performing, high-growth, and high-energy workplace culture. And until you know the #1 thing you must do, you simply cannot successfully prioritize any of these other responsibilities. Additionally, if you don't do this #1 thing, everything else – that launch of the new product line, that new digital marketing strategy you’ve worked on for months, that major client you’ve been courting, even that new wonderkid hire – will ALL fail. So, what is the #1 role of today’s CEO? Your #1 role is to be an environmentalist. That’s right – your #1 role is to be an environmentalist. What I is mean is that before you can be a visionary, a teacher, a coach or the one who raises millions of dollars for that next phase of growth – before any of that can happen successfully – your #1 role is to intentionally and consistently create an environment of FREEDOM rather than fear throughout your organization. There is SO much fear polluting the mental atmosphere of our organizations and our world today. I know this because of the thousands of employees we’ve work with all over the world who have told me and my team consistently about how much fear they feel at work. And all you have to do is turn on the news to hear story after story of leaders, all over the world in all industries, creating environments of toxic and dehumanizing fear and disfunction. Fear can take many forms, and it is often very subtle because most of the time we are either completely out of touch with the fact that we are in fear OR we’ve found a way to pretend we don’t feel it. Fear at work can look like many things for your employees. It can look like fear about the future of the company, fear about finances, fear about the future of their job, fear about what’s happening in your industry, fear about if their manager will be in a good mood today or not, fear of failure, fear of what their colleagues are thinking of them, fear of not being good enough, fear about if they will have to work another weekend and miss yet another one of their kid’s game– you get the idea. All the brain research tells us that when we are in a state of fear, the peripheries of our brain shut down and we get tunnel vision. We get in a kind of brain-fog, and when we in that state, it's proven that we tend to make more short-sighted, bad decisions because we don't see the whole picture as clearly as we would if we weren’t functioning in fear. Just imagine your colleagues and employees and all the fear going on in their heads that you don't even know about and the impact it’s having on their performance, their productivity, their levels of creativity and the way they lead and manage others. 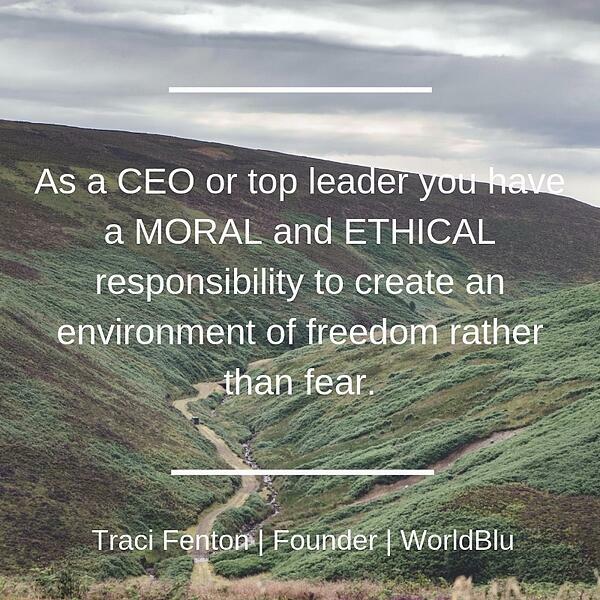 As a CEO or top leader, I believe that you have a MORAL and ETHICAL responsibility to create an environment of freedom rather than fear. You have an ability to either whip people up or cool them down. You have an ability to either plant seeds of worry and doubt OR plant seeds of success and victory. You have an ability to hold your employees small and at a level of mediocrity or you have an ability to help your colleagues rise to the higher standard within themselves. Are my actions creating fear or mitigating fear for our employees? Is this information I’m sharing (or not sharing!) creating fear or mitigating fear for our employees? Is the way I’m communicating (or not communicating!) creating fear or mitigating fear for our employees? Is the strategic direction we’re taking, creating fear or mitigating fear for our employees? Are our policies and procedures creating fear or mitigating fear for our employees? Is the way we treat people here creating fear or mitigating fear for our employees? It may be hard to look in the mirror, but that’s where you have to start. As a CEO myself, I am constantly thinking about the words I use, the tone I set, and the choices I make and if they are cultivating an environment of uncertainty, doubt and fear or a mental atmosphere of freedom, success and possibility. Let me give you an example of what I mean about creating fear in the workplace. Recently, I was talking with a client of ours named John who is a top executive of a publicly-traded company. He told me that every two weeks they have an executive team meeting with their CEO and it’s awful. So horrible in fact, they’ve created a secret code system to help each other cope. When the meeting begins, everything always starts off fine, and then inevitability, someone on the team has to share a piece of news that the CEO doesn’t like. And he starts to get mad. And so, John and all his colleagues will message each other the word – “Vein” because the first thing that starts to happen when the CEO begins to get mad is that the vein on the side of his head starts to pop out and pulse. And then, as things inevitably start to escalate, they message each other the word, “Red” because his face will start to turn red. Yeah, they literally have this phrase because the CEO will start chucking chairs at people, verbally abusing them, and create a complete environment of fear. John told me that after the meeting is over, they all walk out completely demoralized. The fall-out lasts for weeks, until the cycle is repeated again in the next meeting. John told me he spends days afterwards consoling and comforting his colleagues. Productivity drops. Morale plummets. People stop caring. And just imagine the impact all this fear has on employees’ relationships at home! Let me give you another example of leaders creating environments of fear at work. Creating an environment of fear can happen in an instant. Or what about the employee who told me that in meetings with her CEO of a large, global company, he would literally flip her the bird from across the room when she said something he didn’t like. While you might not engage in the kind of overt, fear-based behavior I’ve just described, I promise you, there’s fear in your organization. While I’m sharing some pretty dramatic examples of actions that create a toxic environment of fear, more often than not, fear is very subtle, and it starts in our own thinking. So, in my mind, I’m thinking, wow, that’s really high! But he said it so nonchalantly, as if he wasn’t bothered at all by it. And that’s how fear starts subtly taking over our thinking – it makes us think it’s a motivator and our friend. But fear should NOT be what motivates us or the tool we use to motivate others – our sense of purpose, mission, and vision should be what motivates us and those we work with – NOT FEAR, which is tool of control. But far too often, top leaders fall unconsciously fall back into command and control default behavior which is all based in fear -- and they don't even realize it! The only way out of leading from a place of fear is to recognize it in yourself and then consciously and intentionally choose to think and THEN act from a place of freedom and possibility instead. And that is a daily practice. And at some point, as a leader, you have to ask yourself -- what is ALL the fear in your workplace really costing you? What is it costing you in creativity, innovation, productivity, engagement, brand reputation, trust, an ability to attract and retain the best and brightest talent, and bottom-line growth? It is costing way more than you think. The companies we teach how to operate in freedom rather than fear and control, have on average 7x the revenue growth over a three-year period compared to S&P 500 companies. Why? Because they’ve learned how to systematically address the small to large fears each day in their workplaces. Their leaders recognize the moral responsibility they have to create environments that lift people up, rather than pull people down, so that they are more productive, innovative, and engage. And when they go home each night, their employees are also a better parent, a more loving spouse, and a more engaged citizen of the world. Freedom – NOT FEAR -- creates, the optimal conditions for people to thrive and succeed. Now, let me be clear -- when I say freedom, I am not talking about some Lord of the flies, inmates running the asylum, Pollyanna, utopian, laissez- faire, anarchy-type of freedom. 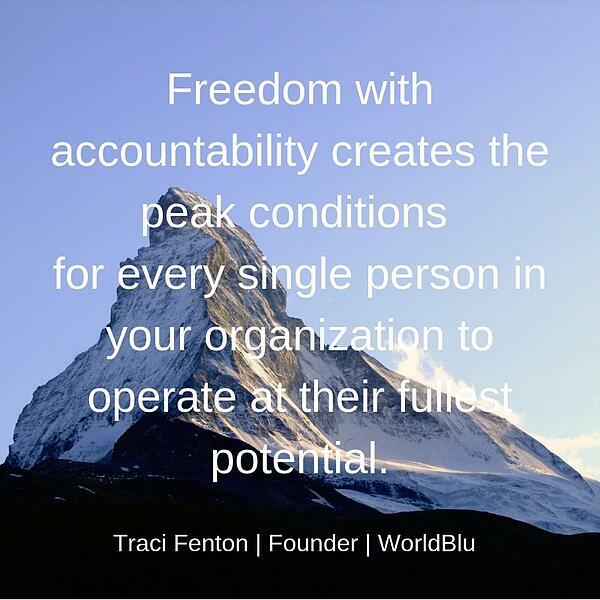 I am talking about freedom with accountability – the kind of freedom that creates the peak conditions for every single person in your organization to operate at their fullest potential. That’s the #1 role of a CEO. To create these environments so that everyone can prosper. When I was 15, I got my first job, which working at a greenhouse. I worked there on and off through high-school and when I would come home on breaks from college. And all those years of working at a greenhouse taught me some powerful lessons about creating environments. For example, the temperature had to be just right for all the variety of plants to grow and flourish. Too much heat and they would fry – too cold and they wouldn’t blossom. The plants had to be watered every day – sometimes multiple times a day. But too much water would drown them, and not enough water would mean they would shrivel up and die. Weeds and dead leaves and flowers had to be pulled out to make way for new growth. Every day was about tending to the macro and micro things that made the environment inside the greenhouse just right so that EVERY plant could come to full bloom. 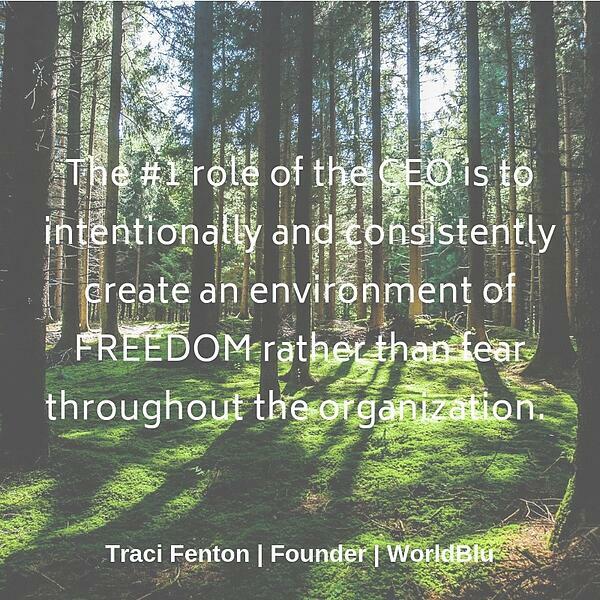 And that is your #1 job as a CEO – to intentionally and consistently create an environment where all of your employees can thrive in freedom rather than fear and control. My friend John’s CEO certainly wasn’t creating those conditions, and neither was the CEO who flipped his colleague the bird regularly in meetings, or the one who completely stripped his high-performing colleague of her dignity in front of others. Eventually, two of the three of these people left their companies to go work in healthier, non-fear-based environments, and the third one moved herself into a position where she didn't have to interact with the CEO as much. I believe, it is your #1 job and your #1 moral and ethical responsibility as a CEO or top leader, to create and maintain a mental, physical, and spiritual environment of freedom, not fear in the workplace, and to recognize the transformational impact this freedom-centered environment has on your employees’ performance and your bottom-line, on their health and well-being on the way they show up in the world. Yes, you teach. Yes, you coach, Yes, you set a strategic direction and yes, you do the millions of other things you have do each day as a top leader. But ALL of that has to be under this umbrella of understanding your #1 role – to be an environmentalist that sets a tone, day in and day out, with your actions, your words, your behaviors, your standards, who you hire, who you fire -- that is 100% committed to doing everything in your power to root out fear by being honest, transparent and operating in integrity, so that you create the optimal environment for success for everyone. When you do this, as we’ve seen with OUR clients, many of which are the most admired brands in the world -- your growth, productivity, morale and engagement shoot up. You create a place where everyone wants to work, and no one wants to leave. I don’t care WHAT you do, people want to work in an atmosphere that lifts them up rather than pulls them down, where they feel emotionally safe, and where they can truly live their fullest purpose and potential. And that’s an environment of freedom, not fear. That is your #1 role as CEO. And once you are clear about your #1 role AS AN ENVIRONMENTALIST, your job is to help others in your organization, beginning at the top, understand that THEIR role is to be an environmentalist as well. And slowly, but surely, you will transform your organization into a thriving, dynamic, high-performing ecosystem that rejects anything or anyone who would try to pollute your environment with fear, and attracts, like a magnet, those who are willing to create and stand for freedom.